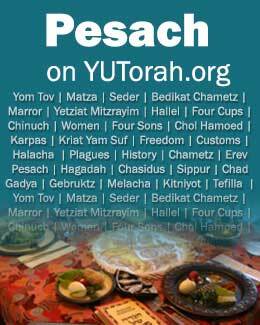 To download the Pesach To-Go in Spanish, click here. Rabbi Yaakov Glasser: "Introduction: Expressions of Freedom In our Own Lives"
Rabbi J.Z. Spier: "Dedication in memory of David Rottenstreich a”h"
Rabbi Dr. Jacob J. Schacter and Rebbetzin Shana Yocheved Schacter, CSW: "The Importance of Leisure: Rabbinic and Psychological Perspectives"
Rabbi Zvi Sobolofsky: "An Overview of the Laws of Chol Hamoed"
Rabbi Netanel Wiederblank: "Rambam’s Guide to Chol Ha-Mo’ed Trips"
Rabbi Michoel Zylberman: "The Shulchan Aruch's Guide to Planning Vacations"
Rabbi Meir Goldwicht: "Echad Mi Yodeah"
Rabbi Naphtali Lavenda: "The Power of Moments Through Nirtzah and the Steps of the Seder"
Dr. Deena Rabinovich: "Eliyahu Ha-Navi and the Seder Night"
Rabbi Zvi Romm: "Looking Past The Everyday: Understanding Chad Gadya"
Rabbi Tanchum Cohen: "The Seder Table as the Original Beis Midrash, and as a Model for Ambitious, Aspirational High School Education"
Dr. Aviva Goldstein: "Mindfulness as a Remedy for Inattentiveness"
Rabbi Michael Taubes: "The Special Need to Provide Appropriate Chinuch to People with Special Needs"
Dr. David Pelcovitz: "Strategies for Dealing with Rebelliousness"
Ilana Turetsky Ed.D: "Maximing and Minimizing: Thoughts on Creating a Family-Friendly Seder"
Rabbi Daniel Price: "Transforming Your Seder Into The Ideal Educational Experience"
Rabbi Shlomo Einhorn: "Complex Questions for a Complex Age"
Ms. Miriam Borenstein: "Once Upon... A Karpas"
Rabbi Mordechai Becher: "Cups, Karpas and Bnei Brak"
Rabbi Elchanan Adler: "Easy Come, Not So Easy Go: Reflections On The Removal Of The Makkos"
Rabbi Elchanan Adler: "The Enduring Covenant: Insights into Bris Bein HaBesarim"
Rabbi Eliezer Barany: "Nachshon and the Jump Heard around the World"
Rabbi Dovid Hirsch: "The Mitzvah of Sefiras Ha’omer"
Mrs. Aliza Abrams Konig: "Experiencing the Pesach Seder"
Cantor Macy Nulman zt”l: "The Shirah Melody in the Ashkenazic and Sephardic Traditions"
Professor Nechama Price: "Moral Clarity Found in Our Hagaddah"
Rabbi Etan Schnall: "Kosher for Passover Teeth?!" Rabbi Benjamin Blech - "The Seder of the Seder"
Rabbi Reuven Brand - "Defining Mesorah"
Rabbi Daniel Z. Feldman - "In Time, Out of Time, or Beyond Time? Women and Sefiras HaOmer"
Rabbi Aaron Goldscheider - "The Giving Jew: Rabbi Joseph B. Soloveitchik on Yachatz and Hachnasat Orchim"
Rabbi Yona Reiss - "Understanding an Unfriendly Minhag: Not Eating Out on Pesach"
Mrs. Shoshana Schechter - "Freedom To…Not Freedom From: Pesach and the Road to Redemption"
Rabbi Mordechai Torczyner - "When Iyov Left Egypt"
Ilana Turetsky, Ed.D. - "How do We Transmit Emunah? Maximizing the Pesach Seder"
Rabbi Daniel Yolkut - "The Original Birthright: Seder Night in Jerusalem"
Rabbi Assaf Bednarsh - "The Message of Maggid"
Rabbi Josh Blass - "Freedom Revisited"
Rabbi Reuven Brand - "The Marshmallow Test: A Model for Success"
Rabbi Daniel Z. Feldman - "Every Step Counts: Making it Through Sefirah Complete"
Rabbi Lawrence Hajioff - "Feel as Though You Left Egypt, But I Was Never There!" Rona Novick, PhD - "Lirot Et Atzmo, Going beyond Empathy: A Psychological Perspective"
Rabbi Uri Orlian - "Anatomy of a Sale: Demystifying Mechirat Chametz"
Rabbi Ari Sytner - "Making God Part of the Passover Experience"
Rabbi Mordechai Torczyner - "A Haggadah Lesson in Divine Justice"
Rabbi Ari Zahtz - "Yachatz: Superfluous or Significant?" Rabbi Ezra Frazer - "Pesach in the Days of Chizkiyahu - the Dream and the Reality"
Rabbi Shmuel Hain - "Davar Acher: On Dual Narratives in the Haggadah"
Rabbi Yosef Kalinsky - "The Seventh Day of Pesach: Seeing the Supernatural within Everyday Nature"
Rabbi Yaakov Neuburger - "The Four Kosos: Songs of Silence"
Rabbi Zev Reichman - "A Night of Questions"
Rabbi Michael Rosensweig - "Ben Neikhar and the Character of the Korban Pesach"
Rabbi Lord Jonathan Sacks - "What Does This Avodah Mean to You?" "Biblical Descriptions of the Exodus" - "Collected insights from members of the Graduate Program in Biblical and Talmudic Interpretation at Stern College"
Rabbi Kenneth Brander - "Rabbi Akiva's Seder Table: An Introduction"
An Interview with Rebbetzin Meira Davis - "Growing up in Boston"
Rabbi Joseph B. Soloveitchik zt"l - "On the Study of Haggadah: A Note on Arami Oved Avi and Biblical Intertextuality"
Rabbi Yosef Adler - "Use of the Term Makom, Omnipresent, in the Haggadah"
Rabbi Reuven Brand - "What Is Judaism?" Rabbi Menachem Genack - "Why Don't We Recite Shehecheyanu on Sefiras ha-Omer"
Rabbi Hershel Reichman - "The Dual Aspect of the Four Cups: A Core Idea of Pesach from the Rav zt'l"
Rabbi Hershel Schachter - "Charoses: Why Don't we Recite a Beracha?" Rabbi Michael Taubes - "Insights from the Rav on the 'Maggid' Section of the Haggadah"
Rabbi Netanel Wiederblank - "Why We Shouldn't Rush the Seder Meal"
YUTeach - "Bringing the Classroom to the Seder Table"
Rabbi Dr. Aharon Rakeffet - "The Religious Zionism of Rav Soloveitchik zt'l: A Synthesis of Worlds"
Rabbi Mordechai Torczyner - "An Optimistic Zionist"
Rabbi Reuven Ziegler - "Rav Soloveitchik on the Significance of the State of Israel"
Rabbi Dr. David Shatz - "Afterword: Memorializing the Rav: Time and the Masorah"
Rabbi Reuven Brand - "The Defining Moment: Once and Again"
Rabbi Menachem Genack - "Sippur Yetzias Mitzrayim as a Special Form of Talmud Torah"
Dr. Naomi Grunhaus - "The Reality of Freedom"
Dr. Jill Katz - "Celebrating Pesach in the Land of the Pharaohs"
Rabbi Yona Reiss - "The Freedom of Family"
Rabbi Eliav Silverman - "Pesach: The Festival of Liberty and Love"
Mrs. Natalie Taylor - "Geared To Go: She'eilat Keilim"
Rabbi Norman Lamm - "Novelty and Renewal"
Rabbi Daniel Z. Feldman - "Bringing the Geulah Through Mekhirat Chametz"
Dr. Steven Fine - "Dining with Rabban Gamliel and Rabbi Yehoshua: Two Early Pesach Sedarim in Context"
Rabbi Josh Flug - "Yetziat Mitzrayim and its Role in Shabbat and Yom Tov"
Rabbi Eric Goldman - "Maror: Finding Meaning in Life"
Mrs. Rivkah Kahan - "The Hatan Damim Episode: A Preamble to Yetziat Mitzrayim"
Rabbi Aryeh Leibowitz - "Pesach La-Shem: Separate Mitzvot for Separate Moadim"
Mrs. Nechama Price - "Splitting the Sea: Take Two"
Rabbi Ezra Schwartz - "Eating Matza all Seven Days of Pesach"
Rabbi Reuven Taragin - "The Pesach Haggada: Developing an Experiential Commemoration"
Rabbi Mordechai Torczyner - "What If I Don’t Like Roast?" Rabbi Mordechai Willig - "How Much Matza Do You Need to Eat?" Rabbi Norman Lamm - "Pesah, Matzah, and Maror"
Rabbi Reuven Brand - "Words of Redemption, Words of Creation"
Rabbi Josh Flug - "The Recitation of Hallel in Synagogue on the First Night of Pesach"
Mrs. Dena Knoll - "Chametz and the Altaration of Our Homes"
Mrs. Yael Leibowitz - "Moshe Rabbenu: Enough Said"
Rabbi Herschel Reichman - "The Messages of Galut Mitzrayim"
Rabbi Yonason Sacks - "The Mitzvah of Sippur Yetzias Mitzrayim"
Rabbi Mordechai Torczyner - "Matzah: A Lesson in Trust and Community"
Dr. Harvey Babich - "Blood, Frogs and Lice"
Rabbi Reuven Brand - "Feeling Freedom"
Rabbi Daniel Z. Feldman - "My House Is Your House: The Mitzvah of Hakhnassat Orchim "
Rabbi Joshua Flug - "The Mitzvah of Eiruv Tavshilin"
Rabbi Menachem Genack - "Rav Soloveitchik on the Destruction of Chametz"
Mrs. Yael Leibowitz - "The Heart of the Matter"
Dr. Michelle Levine - "From Darkness to Light, From Slavery to Redemption"
Ephraim Meth - "Awe and Freedom"
Rabbi Yaacov Neuburger - "So the Children Will Ask"
Rabbi Mayer Twersky - "Zeicher le-Mikdash"
Special Supplement - Activities for kids at the Seder! Rabbi Elchanan Adler - "Bread of Affliction or Bread of Exodus?" Rabbi Eli Baruch Shulman - "The Bread of Affliction"
Rabbi Josh Flug - "Keeping Your Kids Engaged at the Seder: The Talmud's Caffeine-Free Method"
Rabbi Daniel Stein - "Is the Seder Table a "Round-Table" or a Lectern?" Rabbi Michael Taubes - "An Understanding of Charoses & Karpas"
HaRav Joseph B. Soloveitchik - "The Nine Aspects Of The Haggadah"
Rabbi Dr. Norman Lamm - "Passover And Human Diversity"
Rabbi Kenneth Brander - "An Analysis Of Had Gadya"
Rabbi Meir Goldwicht - "Experiencing Yetziat Mitzrayim Through the Seder"
Rabbi Dovid Hirsch - "Twelve Questions On Hallel On Leil HaSeder"
Rabbi Baruch Simon - "Koach Hachesed V'haemunah K'hachana"
Rabbi Zvi Sobolofsky - "The Sanctity Of The Home: The Message Of The Korban Pesach"
Rabbi Jeremy Wieder - "Introduction To The Text And Structure Of The Haggadah"
Rabbi Josh Flug - "Halacha Overview of Pesach related issues"